Michael Jackson fans who purchased tickets for his final concerts will receive a full refund or, if they chose, a commemorative ticket, the concert promoter said Tuesday. "The world lost a kind soul who just happened to be the greatest entertainer the world has ever known," said Randy Phillips, president and chief executive officer of AEG Live. "Since he loved his fans in life, it is incumbent upon us to treat them with the same reverence and respect after his death." Fifty sold-out Jackson concerts were scheduled for the O2 Arena in London, starting July 13, with admission costing at least $105. The shows were billed as the final concerts of his career and were called "This Is It." Fans who decide they would rather have a souvenir will receive a ticket conceived by Jackson. There are eight designs that include holographic images of the entertainer on the front. 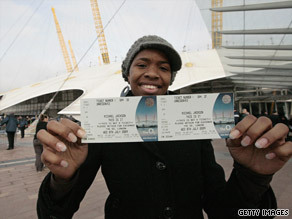 Images of the tickets will be available on michaeljacksonlive.com in coming days, according to the promoter. Refunds will be processed by the issuing ticketing agencies - See, Ticketline, Ticketmaster and Viagogo. That's an expensive souvenir, pretty clever way to NOT refund their money. Wonder how many will go for that idea! he will be in our hearts forever! What a beautiful & sensitve personality! I'M am so so sad about Michael's passing. So, what are you Ted ?? God?? who are you all lots to judge a guy who went through more in is life that most of us will in our. Anybody else in his situation would have gone bananas and sent to mental health institution. You american are crazy with all the press and paparazzi and garbagge magasine. In my heart always Michael! Thank You for your show, and your coverage of MJ...all I can say to your viewers about Michael's life is...Judge Not! for You Will Be Judged! First of all I have great respect for your show. I watch it all the time here in Holland. What I like about your presentation style is that you give everyone a fair shake, even Michael Jackson. As a diehard fan I am glad someone in the media is treating him with the respect he deserves. I have 2 tickets to the Michael Jackson show in London and the last thing on my mind at this moment is the money. I am still in deep shock that this legend has died. What I don´t understand is why people are still talking about these allegations of child abuse when the man was clearly found innocent! They say that in America you are guilty until proven innocent and this innocent man was cleared, so why does the media continue to taunt him? Believe me, if he were guilty then they would have found something during the extensive witch hunt a few years ago. Yes, he was eccentric and not like the rest of us..thank god, that is what made him so special. Let us give the King the respect and adoration he so richly deserves. Thanks Larry for being at least objective! AS a human being we all are sadden by the sudden death of Mike. I believe he deserve reasonable coverage, but now it is too much. Why do not you cover for 5 min the death of one solider who died for our freedom. our media go after money.... not information for the people..
Ted, from you comment one could easily conclude that you're a jerk...but if i were to do so then that would make me no different than you. I do not know you or what you are going thru or have been thru so I can not judge you. You are in no position to judge Michael Jackson or Larry King for that matter. Lets lead by example...we wouldnt want our kids to conduct themselves they way you have via your comment. LK, I personally think its great that you are providing a platform for ppl to reflect on MJ in a positive manner...you may be one of the only media personalities doing so.....Thanks for all you do LK....I wish you luck and a better outlook on things Ted. We have so many different accesses to entertainment, and ways of dealing with major events such as Michael Jackson's passing. With all of the saturation surrounding celebrity deaths (and it seems to keep topping itself), it may be well to try this: Just play his music, programming it in any way, and in any order. A computer with Hi-Speed Internet and a subscription to a music service would be truly worth it. It may also put a lot of this trash about his personal life in perspective. True or not, guilty or not, it should not deter from the first-class artistry of his work. Unfortunately, as long as it remains a story of human interest, the theories, paparazzi and competition for ratings will remain volcanic. I keep thinking about great composers of earlier centuries....Beethoven, Brahms, Mahler, and artrists such as DaVinci and Michaelangelo. Different time, but same tremendous talent that has endured. But, along with genius seems to come indiscretion. Who knows what went on behind the scenes with these gifted people in eras of less media saturation? It doesn't matter, their work is what endures. Michael Jackson's work is what will endure, also. Thank you for your comments, it shows here you come from. Just to please you I will call the pope and have Michael declared a saint, he had an examplary life after all. Just one question; if you had children would you send them to Neverland for a weekend with him? If you say yes then you already told me what you are! Ted, why don't you save it for another time. You want to dwell on something never proven and you give MJ no credit for the incredible charitable deeds over the years. By the way, people will say a lot of things if they might net $20 million. If I remember, Michael Jackson had doubler for scene. Could he, or they if Michael had more than one doubler, continue his work and to start tour at July 11, 2009, until March 2010!????? This would be best deal. Money will be returned, and huge mountain of Michael debt (which is in hundred milion's). We should help in this world economic crisis. That why I am thinking that best idea is to not cancel all these concerts!!! Think about that. There is big truth, and this is worth of trying.